צד אחד בנקאי משולד עם כובע Top Hat בורח בריצה עם שק כסף בידו עם שטרות דולרים מאחוריו,והמילים "Too Big to Fail"
בנקאי משולד עם כובע Top Hat בורח בריצה עם שק כסף בידו עם שטרות דולרים מאחוריו,והמילים "Too Big to Fail"
מטבע כסף גדול מדי ליפול מסדרת Bankster שנת 2014 משקל אונקיה The third release in the "Rise and Fall of the Banksters" mini-series captures the clarion song used to justify bank bailouts during the crash of 2007-2008. "Too Big to Fail" are four words that some claim have killed not only capitalism, but also serve to allow the big banks to simply steal money. With these four simple words justification is given to backstop all the losses of the major banks. So why would it be surprising to see one run off with a bag of ill-gotten gains? 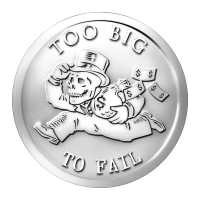 The obverse features a design by Heidi Wastweet that shows a skeletonized tycoon running away with some of the ill-gotten achieved by the deception that they are "Too Big to Fail", a catchphrase that has come to symbolize the stranglehold that money lenders have on not just the US, but the entire world. The words themselves are written large and the bankster himself is seen hurrying away. The reverse shows the revised Silver Shield logo with the trivium in the centre encircled by the words "Silver Shield 1 Troy ounce 2014 999 Pure AG" surrounded by 47 bullets. This coin make a great conversation starter or addition to any silver or Silver Shield collection.